DESKS: Matching pair of pale aqua desks made in the 1950's, by Halls Lifetime Toys, based in Chattanooga, Tennessee, USA (sadly, no longer in existence). Each desk has two deep drawers with brass knobs and the typical tapered legs, so favoured by furniture designers of this era. LAMPS AND DESK ACCESSORIES: Each desk has a handmade lamp with a pleated paper lampshade. The desk on the left holds an array of amazing, fully functioning, coloured pencils from Italy, a little cactus plant, and a stack of dolly's school work. The desk on the right has a sign reading "Keep Calm and Lick a Lolly", a little wooden plate holding two lollipops, a pair of scissors and a stack of dolly's schoolwork. 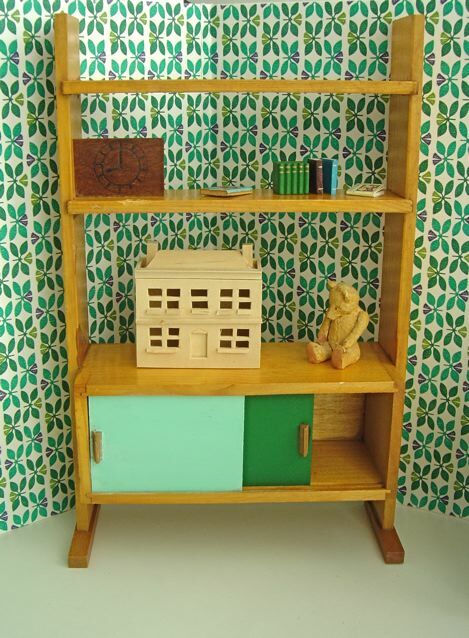 SHELVES: A stunning period piece, of unknown origins, featuring bi-coloured sliding doors. 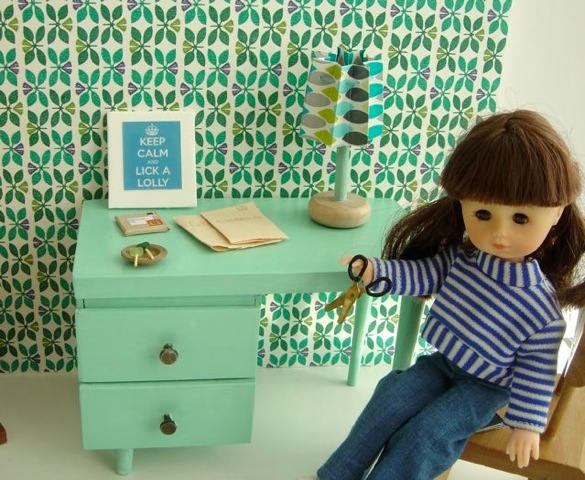 On the shelves: a tiny doll's house, a wooden clock fixed to the shelf, and a selection of books. CHAIRS: Pair of mid-century wooden chairs made by Strombecker, and stamped on the undersides. 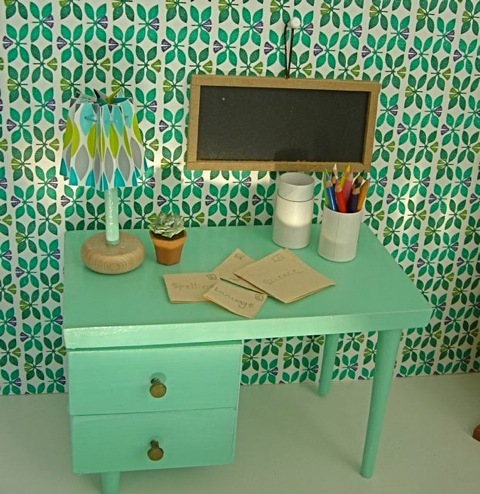 WALLS: Covered in wrapping paper featuring a vintage textile print. It has been mounted on two A3 pieces of 5mm thick foam board. Each piece of foam board measures 42 x 29.5cm or 11 5/8 x 16 3/8in. There is also a little blackboard pinned to the wall. Dolls: Chosen from our selection of vintage dolls. 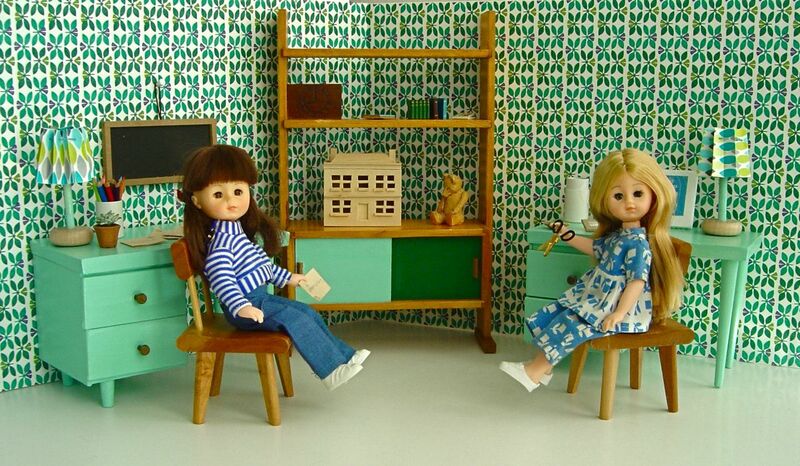 Shown here, two Lesney Ginnny dolls in their playclothes – please see the DOLLS section of this website. Note that there are lots of other clothes available for these dolls – please see the CLOTHING section of our website for an idea of what is available.